Hey guys, today is a bit of a serious post. 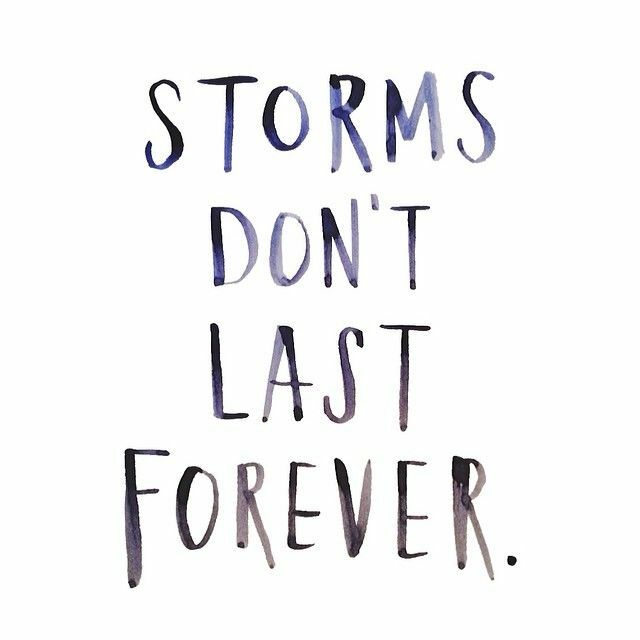 Throughout our lives we all go through a number of storms. Everything is fine and then something devastating takes us off guard. Something messes up the path we thought we were on or causes us to lose our way. One thing you need to know when going through something horrible is that it won’t last forever. Even if the situation may seem like it will last forever, your attitude, the amount of pain it causes you and how much it effects you will eventually change. Storms are a part of life, and whether or not we like them, they come and go. We have a certain amount of bad times that we are going to go through. Sometimes I think it helps a little to wallow in the pain a bit and feel miserable. It helps us to grieve; to understand that we lost something, someone or a even the idea of the life you thought you were going to have. But at some point, we need to pull ourselves together and face it head on. We need to get back to our lives and not let the situation break us. There is a time when enough is and enough and you have to decide to fight it. It may not be ideal that this happened or that you feel this way but you can get through it. Just take one day at a time. Eventually the rain will stop.